Congressional staff members stand in solidarity on the steps of the Capitol in protest of recent decisions regarding the Garner and Brown cases. 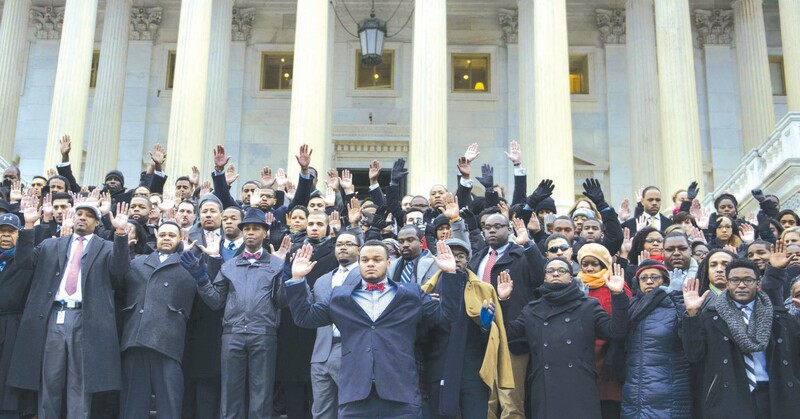 The protests over the lack of indictments in the Eric Garner and Michael Brown cases have expanded to Congress. Congressional staffers walked out of their jobs Thursday, December 11 in a symbol of solidarity with protests taking place in the streets, on the basketball court and on football fields across the country. They bowed their heads as Senate Chaplain Barry C. Black prayed, “Forgive us when we have failed to lift our voices for those who couldn’t speak or breathe for themselves” — emphasizing “breathe” in reference to Eric Garner, who died after a policeman grabbed him in a choke hold in New York. Meanwhile inside the Capitol, the House of Representatives was struggling to come up with the votes to pass a government funding bill that would keep the government open. Cummings is one of several members of Congress who requested hearings on the issues raised by Garner’s and Brown’s deaths. The demonstration was organized by the Congressional Black Associates and other groups representing minority employees of Congress to show support for protests around the country. On the grounds nearby, Valerie Bell — the mother of Sean Bell, shot in New York on the morning of his wedding — watched with other mothers whose sons were killed by police. Nine mothers have been meeting with Congress members and Washington officials this week asking for an end to police brutality against black men. “We stand with them, and they stand with us,” Bell said as the congressional employees gathered outside in the cold.